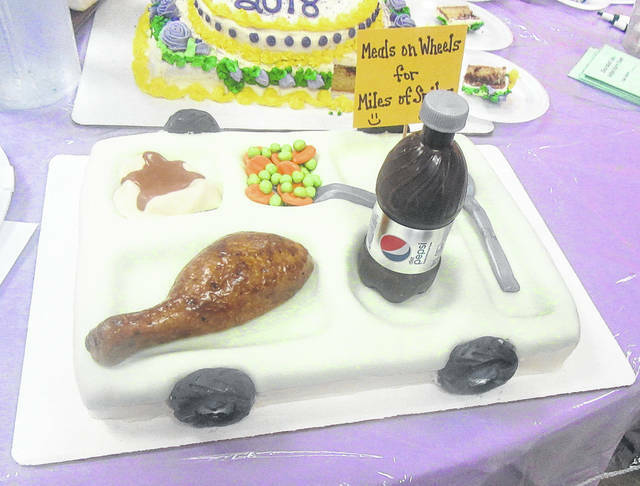 ”Don’t Spill the Milk” was one of the many decorated cakes entered in the contest in 2018. The cake decorated by Sammi Mugrage was named the grand champion in 2018. 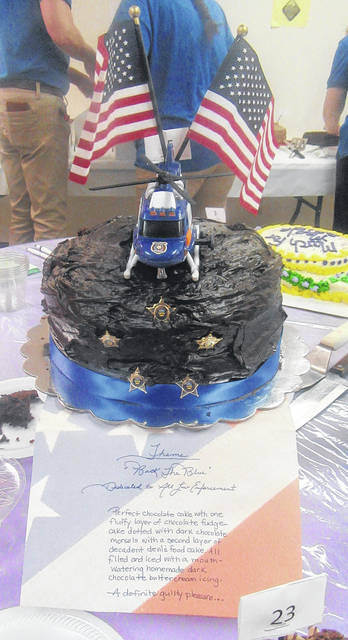 The law enforcement themed cake by Jeremy Fisher took home the Director’s Award in 2018. POMEROY — There is more to March than March Madness. Every year since 2001, the Meigs Council on Aging has observed March for Meals, an annual event that is observed by Meals on Wheels America and local programs across the country. March for Meals is held to promote the local programs and to educate the public to the importance of good nutrition for older adults. Current statistics indicate that one in six Americans over the age of 60 does not have enough proper food to eat for optimum health. It is likely that it is much higher than one in six in our Appalachian area. Each category will have a first and second place winner. There will also be a Grand Champion and Reserve Champion cake chosen from among the winners. In addition, there is a Director’s Award that is picked by the Executive Director from all the entries. Trophies are presented to the winners in each category. The Grand Champion, Reserve Champion and Director’s Award winners will receive a cash prize in addition to a trophy. In the past the money raised by this venture has helped provide thousands of meals, maintain delivery vehicles, buy gasoline and insurance and replace equipment. This year, the money will be used to provide meals and help with the renovation of the kitchen in our Middleport building. 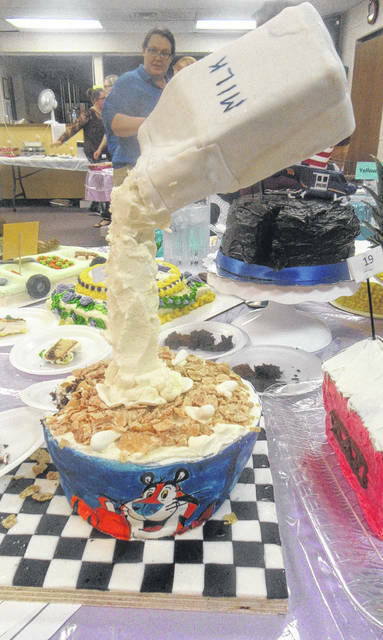 This year the March for Meals dinner and cake contest will be held on Thursday, March 28 at the Meigs Multipurpose Building (Senior Center) at 112 E. Memorial Drive, Pomeroy. Cakes can be registered beginning at 8 a.m. that morning until 4:45 p.m. that afternoon. Cake judging begins at 5 p.m. and the auction will begin at 6:30 p.m. Billy Goble will be our auctioneer again this year. We are serving our popular seasoned baked chicken, mashed potatoes and gravy, green beans, roll, cookie, tea, water and coffee. Tickets are $10 for adults and $7 for those age 12 and under. The food is being prepared by our Close to Home Catering crew and will be served between 5:30 and 6:30 p.m. Early bird tickets are available now and by purchasing your ticket by 4 p.m., March 27 you have a chance to win a new smart 32” television. Tickets are available at the Council on Aging/Senior Center in Pomeroy. Helping us make this fundraiser a success are our event sponsors. Our thanks to our Corporate Sponsors: Subaru of America, Home National Bank, Farmers Bank, AEP River Transportation, Smith’s Construction, Mark Porter Autogroup, and Transitions Home Health Care & Hospice. This year’s Platinum Sponsors are REMRAM Recovery, LLC, and Swisher & Lohse Pharmacy. Gold Sponsors are D.V. Weber and PDK Construction, Inc.. The Silver Sponsors are McDonald’s of Pomeroy, Angell Tax Meigs, LLC, Racine Optometric Clinic, Douglas D. Hunter, MD, Auto Options, and Jack’s Septic Service, LLC. The 2019 Bronze Sponsors are Oliver Packaging & Equipment, King Ace Hardware, Hill’s Classic Cars, LLC and Pomeroy Flower Shop. These sponsorships go a long way to helping us feed our seniors. This will be the last time this event is celebrated in the current location. Next year we will be in Middleport. There will be a special announcement at this year’s celebration about our new home. For more information about entering a cake or buying a ticket please call us at 740-992-2161.